​This book poses the question: How can we organize society in such a way that our disagreement about facts and norms works to the benefit of everyone? In response, it makes the argument for polycentric democracy, a political arrangement consisting of various political units that enjoy different degrees of independence.It is argued that to progress towards justice, we first need to change our attitude towards reasonable disagreement. Theorists have always viewed reasonable disagreement as nuisance, if not as a threat. However, this work puts forward that the diversity of perspectives which underlie reasonable disagreement, should be viewed as a resource to be harvested rather than a threat to be tamed. 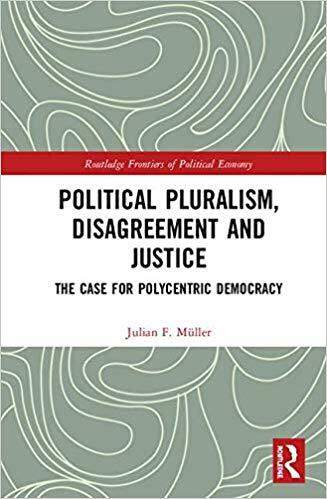 Resting on two key arguments, the author proposes the idea of polycentric democracy as the most capable method of making pluralism productive. The book explores what such a political order might look like and concludes that only an institutional system which is capable of profiting from diversity, such as polycentric democracy, might reasonably be expected to generate an overlapping consensus. This book lies at the intersection of philosophy, political economy and political theory. It will be of great interest to academics and scholars working in philosophy, politics and economics. Epistemic Democracy - Beyond Knowledge Exploitation - In: Philosophical Studies 75(5) 2018: 1267–1288.. This essay criticizes the current approach to epistemic democracy. Epistemic democrats are preoccupied with the question of how a society can best exploit a given stock of knowledge. This article argues that the problem-solving capability of a society depends on two variables rather than one. The quality of decision-making depends both on how a democracy is able to make use of its knowledge stock and on the size and quality of the knowledge stock. Society’s problem-solving capability over time is therefore a function of its ability to develop its knowledge exploitation mechanisms and the growth rate of its knowledge stock. Based on this enhanced model of the epistemic capability of social problem-solving, this essay compares two different political ideal types: experimental democracy, as commonly defended by epistemic democrats, and polycentric democracy, a model defended most commonly by political economists. Large-scale social experiments in Experimental Ethics – In: Rusch, H., Uhl., M., Luetge, C. (ed. ): Experimental Ethics. Palgrave 2014. In this article, I argue that experimental ethics – like experimental economics – should also concern itself with field experiments. In particular, I defend two claims: a) that philosophers in normative ethics could considerably narrow down their disputes if they could agree on a wider range of socio-economic facts; and that b) the socio-economic facts that would be needed for this could only be generated by deliberate large-scale social experimentation. This essay normatively grounds my interest in special administration zones. Competition and Systems of Solidarity – In: Hruschka, J. and Joerden, J.C. (Eds.) (2014), Jahrbuch für Recht und Ethik/ Annual Review of Law and Ethics, Duncker et Humblot, Berlin. (Tranlated title). The current political and academic debate revolves primarily around the question of what kind of social system a modern society needs. This question includes important normative as well as instrumental aspects. In this essay, I pursue the question of how modern societies can best achieve progress in both dimensions. The standard response – both politically and academically – is that we can improve our social system best through piecemeal engineering. In this essay, I oppose this consensus and ask if a competition between decentralized social systems would not be a more apt means to our shared goals.